When you hunt with an AR15 even a wolf is a sitting duck. 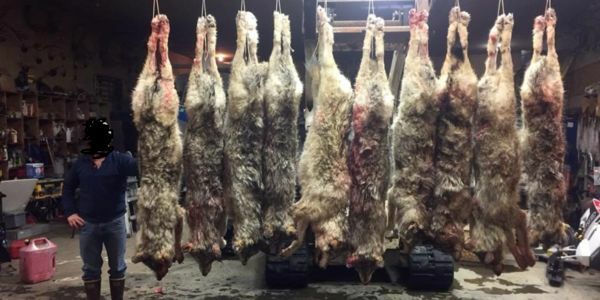 That's what the Alaska Department of Fish and Game (DFG) is finding out after officials investigated one "hunter" who went to the edge of the Denali National Park and waited for the wolves to enter into unprotected lands before he bombarded them with bullets. The story just adds truth to the claim that the wolves of Denali are in trouble. For years activists have been fighting to create a permanent no-hunting buffer around the park that would shield unsuspecting wolves from the dangers lurking just beyond the reserve. No animals are aware of the invisible lines humans use to delineate their safe zones, and in the wolf's case, stepping one paw out of the national park could lead to their death. This year, the area around the park has had an extremely high wolf harvest rate — more than the past 5-year average. When hunting is allowed, family groups are disrupted and the viability of entire wolf populations are put in jeopardy. That's what happened in the Yukon-Charley Rivers National Preserve — a park not too far from Denali. Hunting became so destructive in and around the area that scientists had to end a 20-year research program on predator-prey relationships. The reason? The wolves of the park no longer lived in a natural state. The problem is now so grave that the wolf population will likely collapse without intervention. We cannot let this happen to the wolves of Denali. We must protect the remaining Denali wolves from a horrible fate. Please sign the petition and tell DFG to listen to the scientists that are sounding the alarm and implement a permanent buffer zone around Denali National Park.